In August, DOT SIM crews began improving the median tips and constructing openings in the concrete center median on 3rd Ave at 57th St and 58th St. These improvements will create safer crossings for pedestrians and improve motor vehicle circulation within Sunset Park. In May 2018, DOT crews began constructing new concrete pedestrian ramps and installing roadway markings on 43rd St between 1st Ave and 5th Ave.
Chat with a Street Ambassador! NYC DOT's Street Ambassador team will be in Sunset Park in the coming weeks to learn about how you get around the neighborhood. The second workshop for the Upland Connectors project was held April 16th, 2016 at the offices of Brooklyn Community Board 7. NYCDOT presented the three Upland Connector streets identified by the community, based on input collected during workshop 1 (held October 28, 2015). A MULTI-MEDIA PLANNING APPROACH: We're pleased to present three videos produced by UPROSE that played an important role in the community involvement process of the Upland Connectors project. The Next Sunset Park Upland Connectors Workshop! Currently NYC DOT is analyzing the data collected at our first workshop. Be on the lookout for an email announcing the second workshop in March of 2016, where we will present a package of preferred routes and potential street designs identified by the community. Join us for a transportation planning workshop hosted by UPROSE. 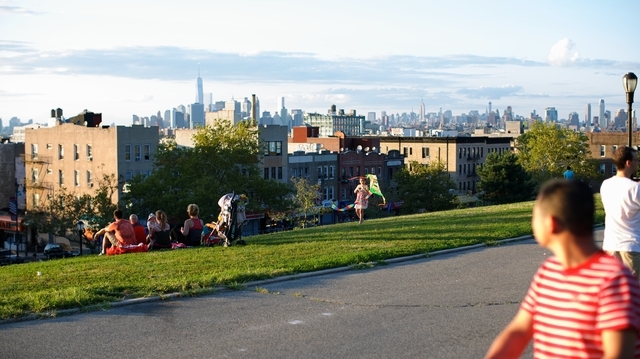 We will be discussing existing conditions and neighborhood perceptions in Sunset Park.